Teenage gun control activists from the March For Our Lives movement held a town hall in South Philadelphia Tuesday night. Among the panelists were Philly students from Parkway Center City Middle College. For one veteran officer, the gunshots that brought police to a North Philadelphia address in 2016 were simply an "ordinary occurrence." The officer wasn't exactly wrong. And she wasn't saying anything that countless others haven't said before. The area in the Fairhill neighborhood has a reputation for drug sales and gunfire. On the night police responded to calls of shots fired, three men were hit, two fatally. Now, a man is on trial for murder, and as I listened to the policewoman's testimony this week, I couldn't get past her casual characterization of the deadly gunplay. This, I thought, is exactly what the Philadelphia students who participated in a town hall about gun control — organized by the national, teen-led March for Our Lives movement — just a couple of days earlier in South Philly were up against. This feeling, this acceptance, that gunshots are the everyday, ordinary backdrop in so many of the city's neighborhoods. Daily shootings have been reduced to a collective shrug. Families mourn fathers and uncles and brothers and sisters gunned down, sometimes right in front of them. Children wonder if they will get to grow old, as kids their age and younger are ripped apart by bullets. At least 97 young people ages 18 and under have been shot in Philly so far this year. "It's painful to hear people call shootings ordinary," said Dena Hill, a student at Parkway Center City who participated in the town hall. "That's not the way it should be. It shouldn't be normalized. That's what we have to change." She's absolutely right, and yet it's hard to argue that it's not routine, as the shootings and killings in Philly keep adding up and most barely register outside the neighborhoods. As of the morning of Aug. 10, there have been 802 shooting victims; 160 of them died. Numbers that will likely be outdated by the time you read this. My heart ached for the Philadelphia students at the town hall the first time I met them at their school, Parkway Center City Middle College. That was in March, and the ninth graders were debating whether they'd stand in solidarity with the Parkland, Fla., school shooting victims calling for gun reforms when the violence many of them faced daily in their Philly neighborhoods went ignored. >>READ MORE: Philly teens to Florida teens: Would you have stood in solidarity with us? My heart soared as I watched them onstage Tuesday with student activists from all over the country demanding that their pain be seen, their voices heard. This must be what it's like to be a parent, I thought, chest swelling with pride while I took photo after photo of the Philadelphia students speaking to an audience at Universal Audenried High School. Two of the students, Simone Akridge and Anissa Wheeler White, were panelists. Hill was co-moderating. Summer hasn't slowed down their activism. They are planning their own anti-violence event in September. Inspired by the call to action by Parkland students who insisted that all victims of gun violence be heard, they stepped into their own power to speak for the lives of kids who looked like them. All mass shootings should matter, whether they happen at suburban schools, in movie theaters, at nightclubs, or on a Philly street corner, where on Wednesday six people were wounded — two fatally — in a drive-by shooting in North Philadelphia. 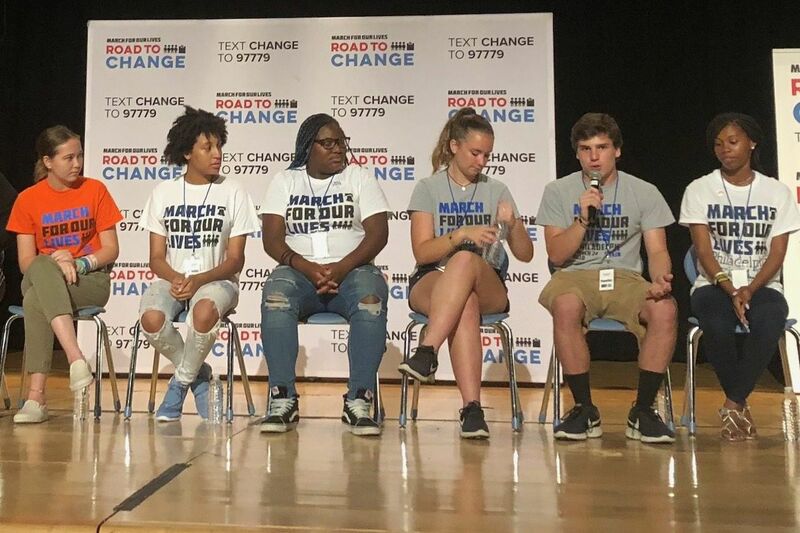 On stage the night before, the students sat in front of a sign that read "Road to Change" as they discussed the obstacles to combating gun violence, and I found myself wondering, once again, what that road would look like in Philadelphia. "It doesn't always make the news, but we want it to stop," Akridge said. Everyone seems to have an idea, some better than others. Theories, too, as to why gun violence persists. Too many that conveniently place the blame on those being victimized, and that conveniently erases their realities and their voices by insisting that they aren't stepping up. Some aren't, but many are. People and institutions in positions to help or amplify their efforts have just chosen not to acknowledge them. At the town hall, I sat next to Yullio Robbins, a mom who is relentlessly seeking justice in the slaying of her 28-year-old son, executed in 2016 on a Germantown street in the middle of the day by someone who pumped 12 bullets into him as he begged for his life. What did she think that road looked like? I asked. She paused, and then gestured behind and in front of her. Like them, she said, pointing to the young people on the stage and in the audience. Young people from different backgrounds and experiences, but with the same message. Gun violence is anything but ordinary.